Need a push to reach your goals? Join 1,700+ go-getters. Join 1,700+ go-getters just like you! 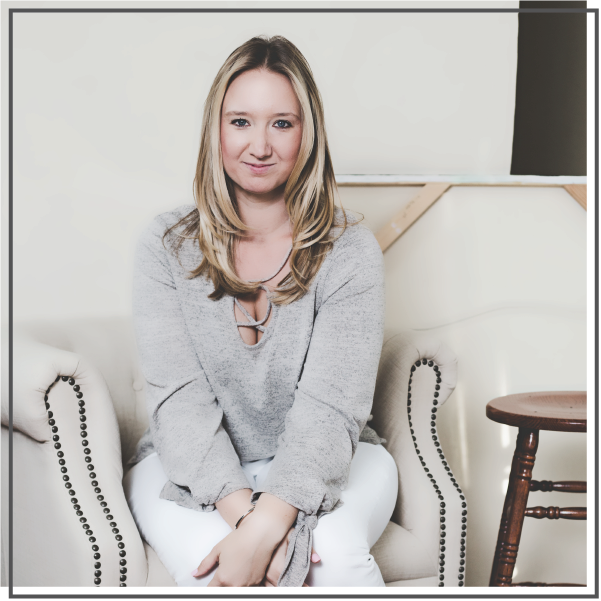 You’ll get inspiring, raw and honest emails twice a month, filled with ideas, tips and action items to step outside your comfort zone and crush your big goals. It’s no secret that I love to travel. My family tends to lean toward island vacations and all inclusive resorts, so last year my mom and I set a goal to visit one U.S. city together each year. There’s so much to see and do right here in the states and there are SO many places I haven’t yet been. Last year, we took a mother-daughter trip to Savannah, Georgia and we LOVED it. 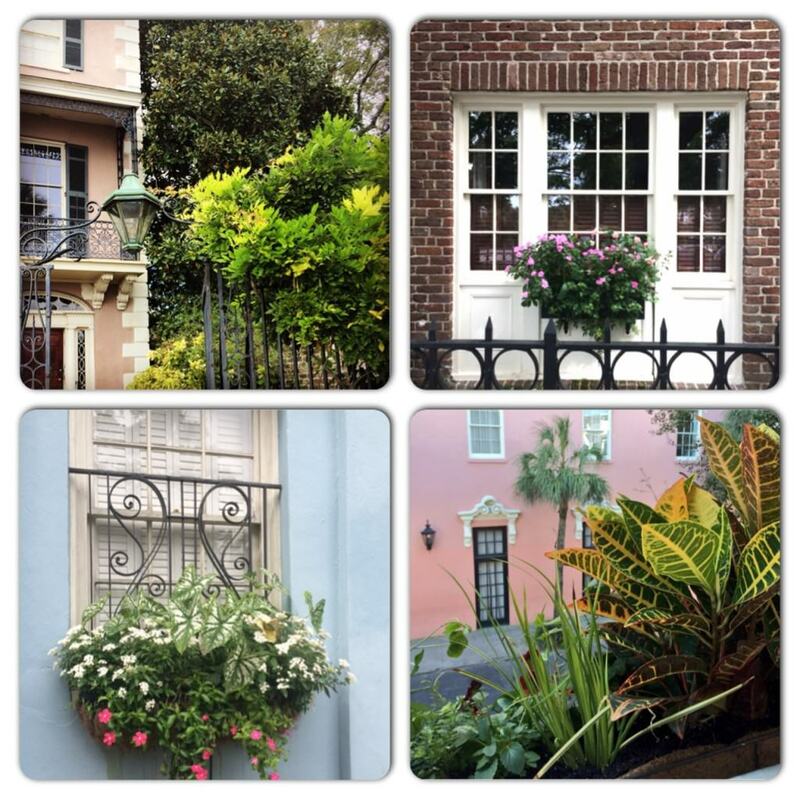 This year, we continued our Southern trend and visited Charleston, South Carolina. If you’ve never been to Charleston, here’s your guide to a long weekend getaway in this charming Southern city. Why Charleston? : Working in the tourism industry, I tend to keep up with industry news and attend lots of tourism-related events and conferences. At a conference I attended last spring, I heard from the team at the Charleston Area Convention & Visitors Bureau during a session about how to get your destination included in top magazine’s travel rankings and awards. Charleston is famous for their recognitions, including being named the best destination in the U.S. and second IN THE WORLD by Travel + Leisure. At that same conference, I also learned about a simple, yet super effective Instagram effort the team at the CVB does where each morning they post a pretty picture of the city and write, “Good morning from #Charleston.” I began following their account and after months of seeing their gorgeous photos, Charleston was in my consideration set when my mom and I started brainstorming destinations to visit this time around. First impressions: Charleston is absolutely beautiful. The streets are extremely quaint, the city is super clean and it’s actually way more modern than I anticipated. That gorgeous Charleston architecture! I can’t get enough. 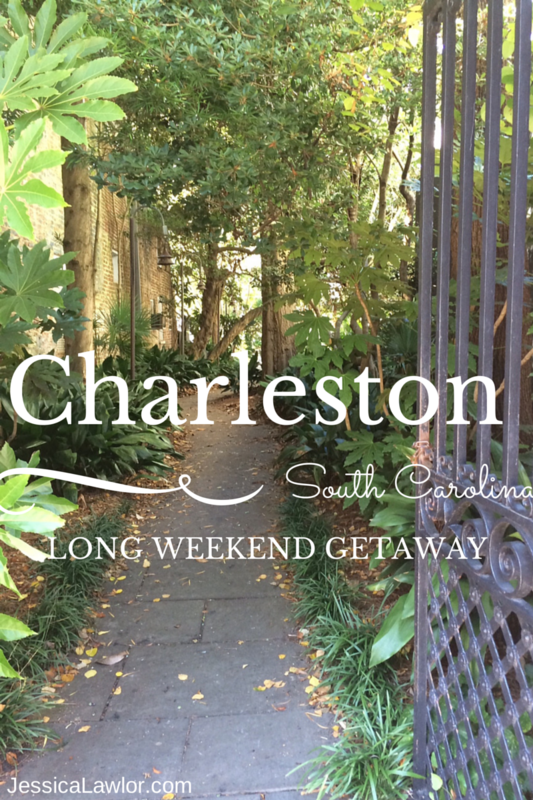 How long we stayed: Charleston is a quick hour and a half flight from Philadelphia. My mom and I arrived in Charleston around noon on a Saturday and left around noon on a Tuesday. We could have used a half day longer, bringing us to a total of three full days, but we managed to see a good amount in our 2.5 days exploring Charleston. Where we stayed: We stayed at the Hampton Inn Charleston Historic District. We had also booked two other more boutique-y hotels (the King Charles Inn and the Andrew Pinckney Inn) but ended up canceling those reservations in favor of a less expensive option. I would have LOVED to stay at one of these other inns, but the truth of the matter is, we only slept in our rooms and it didn’t seem worth it to spend more than $1,000 on a hotel room for three nights we’d be in for a very limited amount of time. The Hampton was nice enough, offered free breakfast and was conveniently right across the street from a free trolley stop and the city’s main Visitor Center. My only complaint about the Hampton is that it was pretty far away from the main hub of town. Where we ate: Charleston is known for it’s amazing Southern cuisine. Keep in mind, I’m a super picky eater with lots of food allergies, so I’m not always the best judge when it comes to food, but in any case, here’s the top spots we ate. 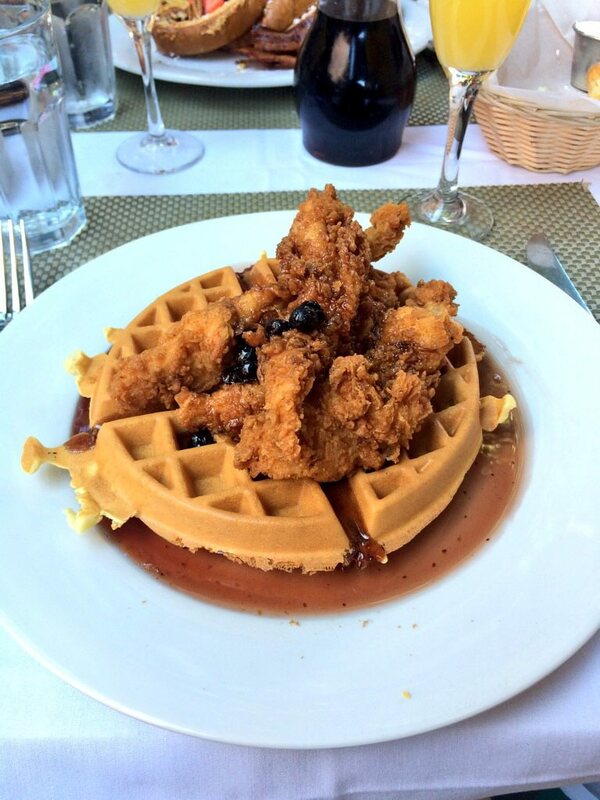 Chicken and Waffles at Poogan’s Porch. Poogan’s Porch: Poogan’s Porch was recommended to me by several different people for brunch, so as soon as we got into town, we made a beeline for this adorable dining spot off of King Street on Queen Street. I definitely started my vacation off right with a delicious meal of biscuits and chicken and waffles with a BLUEBERRY syrup. This meal was seriously heavenly and kept me full all day. Husk: Husk also came highly recommended as a must-eat spot in Charleston…it’s one of the top restaurants in the city and despite making reservations a couple weeks in advance, we still had a pretty early dining time of 6 p.m. This actually wasn’t my favorite restaurant- the service was excellent, but it seemed pretty overpriced for the food we got. If this restaurant is on your list, try to make your reservation 3-4 weeks ahead of time! Magnolias: Magnolias was another restaurant that kept popping up when I asked for recommendations. It was highly regarded for its delicious Southern cuisine. I was told their fried chicken was a must and I have to admit, it was pretty delicious! Kaminsky’s: Kaminsky’s is a dessert bar right near the City Market in the main part of town. We stopped here one afternoon for a happy hour consisting of wine and this decadent Caramel Pecan Cake. YUM. Carriage Tour with Palmetto Carriage: Charleston is famous for its carriage tours and there are several companies to choose from. We went with the Visitor Center’s recommended company, Palmetto Tours, and we were not disappointed. This was a great way to see some of the city and learn a bit of history. I highly recommend doing this on your first day to get the lay of the land. The famous Avenue of Oaks at Boone Hall Plantation, as seen in The Notebook. 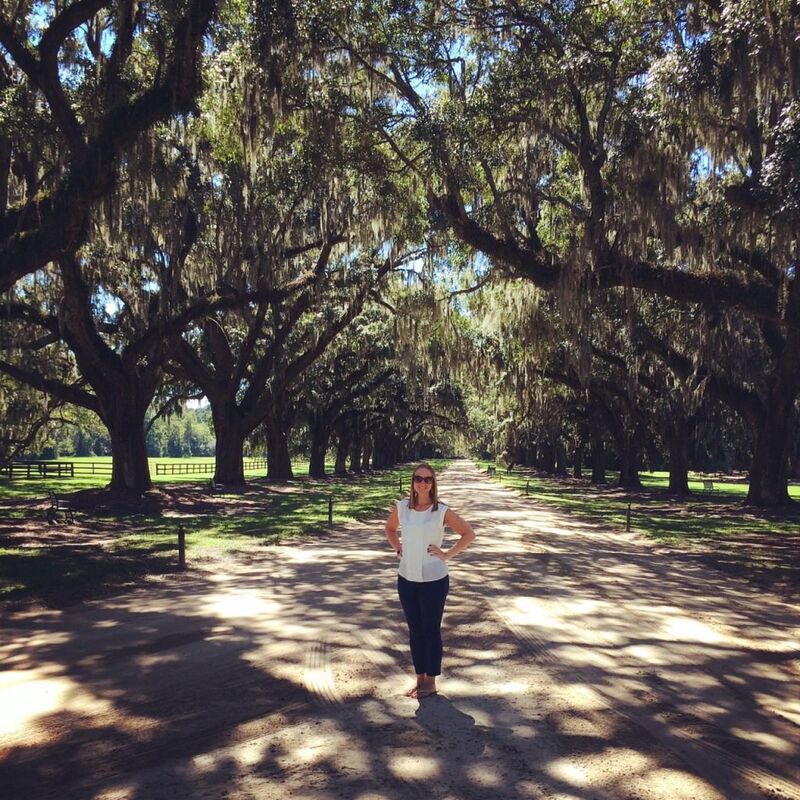 Boone Hall Plantation: If you go to Charleston, you must visit a plantation. There are a few to choose from, but we selected Boone Hall Plantation because it was in the movie The Notebook. The plantations are outside the city, so if you don’t have a car, you can book a tour through the Visitor Center that includes transportation. The tour of the actual plantation home was quite brief and only included three rooms on the ground floor, but we enjoyed exploring the grounds and learning about the history of the area. Rainbow Row: I was most excited about Charleston to see the beautiful, historic and colorful homes that line Bay Street. Rainbow Row has become famous for just that. Waterfront Park: If you want to take a moment to relax within the hustle and bustle of the city, stop by Waterfront Park. 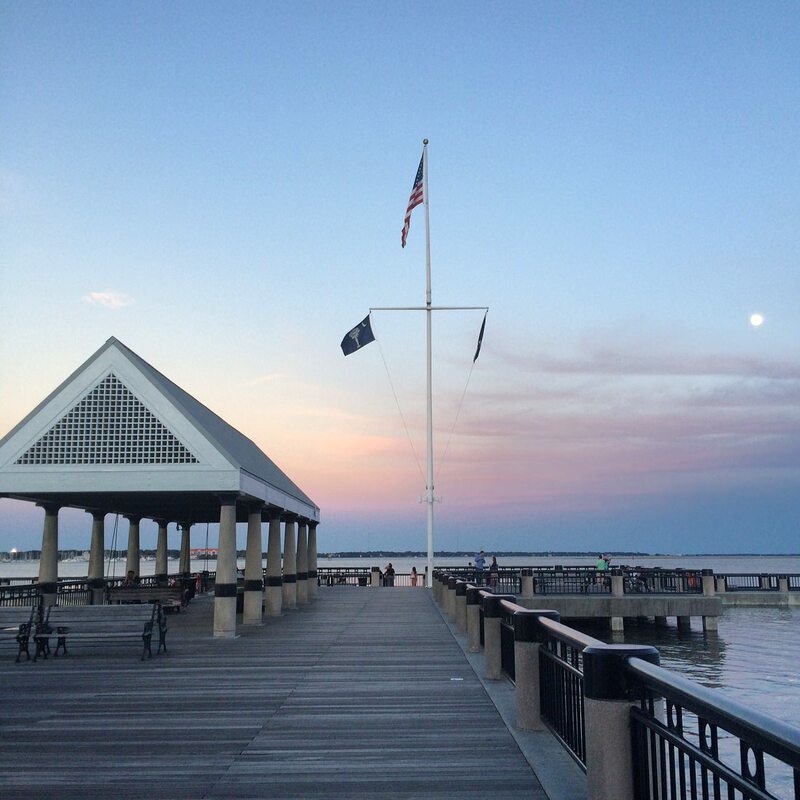 It’s a peaceful, serene spot looking out at the Charleston Harbor. Pro tip: there are a couple of swings on the dock…if you snag one, sit back, relax and swing your cares away. Be sure to look out for the Pineapple Fountain! This would also be another great spot for a run. Edmondston-Alston House: I love touring historic homes and I’m SO happy we were able to squeeze in a tour of this gorgeous mansion on our last day in Charleston. It’s a quick, but packed 30 minute tour of a house dating back to the 1700s- a descendent of the original homeowners still lives in the house today! Charleston City Market: An outdoor open-air market, hundreds of vendors set up here each day to sell their wares. This was a fun spot to browse and wander through, though we didn’t buy anything. Be sure to watch the crafters make the Sweetgrass Baskets. Very cool. Shopping on King Street: King Street is a haven for shopaholics! With a mixture of name brand high-end stores and charming, independent boutiques, King Street features blocks and blocks of shopping. I didn’t get to shop as much as I would have liked, but I did enjoy a two mile run window shopping along the street one morning. Ghost Tour: For some reason, I can’t recall the company we booked a Ghost Tour with, but there are several options for spooky, evening ghost tours in Charleston. I love being spooked, so I enjoyed hearing the stories and getting chills during this hour and a half walking tour. Getting around: This was my one major con for Charleston- I found it extremely difficult to get around without a car. It seemed like most people we talked to while there had their cars with them and could navigate around much more easily and quickly than we were able to. I felt like my mom and I spent a ton of time figuring out how to get from place to place. Charleston does have a FREE trolley system, which is very useful for visitors traveling without cars, but the trolley wasn’t always super reliable and still took longer to navigate than I would have preferred. We walked a ton and also used pedicabs to get around. I didn’t notice too many actual taxis on the street, which seemed a little odd. If you love the movie The Notebook as much as I do, you’ll love Charleston. Stop by the American Theater on King Street…it’s the very spot where Noah and Allie went on their first date! Also, visit Boone Hall Plantation- scenes were filmed there and it’s where Allie’s parents lived in the movie. Utilize the city’s Visitor Center! It’s an amazing resource. Each morning we headed over to the Visitor Center to get recommendations and book our tours for the day. Booking tours through the Visitor Center also often offered a discount on admission to several of the places we visited. The team there was also incredibly helpful in giving us honest suggestions on what to see and what to skip to best maximize our time in town. What We Missed: If we had more time in the city, here are a few of the things I would have loved to do. Visited one of the beach towns like Folly Beach or Sullivan’s Island. Spend more time in the Battery section of Charleston just wandering around and admiring the beautiful homes. Visit another plantation like Magnolia Plantation or Middleton Place. There were also several other recommended restaurants we didn’t have time to visit, including Slightly North of Broad, FIG, McCrady’s, Hominy Grill, Low Country Bistro and The Vendue. Waterfront Park at sunset. Pretty as a postcard! Final impressions: While Charleston is extremely beautiful (I love the architecture and gorgeous homes), I didn’t love it as much as I had hoped. Perhaps I had too high expectations after all I had read about the area, but I found it difficult to get around without a car which really set us back in terms of the number of things we could see and do. I was also disappointed in the level of friendliness in the city. The South is known for being friendly and I didn’t really experience that here in Charleston as I have in other Southern cities. I’d definitely go back to Charleston, but would love to experience it with a car and a friend who knows the city well so we could better maximize our time there. Where to for our next mother-daughter getaway? : We’re already thinking ahead to next year! We’re currently torn between New Orleans and Boston. We’ve got some time to figure this one out though. *For more Charleston photos, check out my album! Have you ever been to Charleston? I’d love to hear what you thought of the city! What else would you add to this list of must-sees? I live by the saying “Life begins at the end of your comfort zone” and help others do the same to reach their biggest, brightest goals. Read my story here.